Spiritual communities all over the globe and for thousands of years have known about the power of the circle. From native American Indians to Tibetan Buddhists, many aware and connected peoples use mandalas to help them find peace, answers, healings . .. and more. Until now however, most books about Mandalas merely provided an outline of an established mandala pattern for you to colour in. Nothing wrong with that, but what if you want to go a bit deeper? This book is for those who are ready to create their own mandalas, to truly enter into their creative energy and inner power. 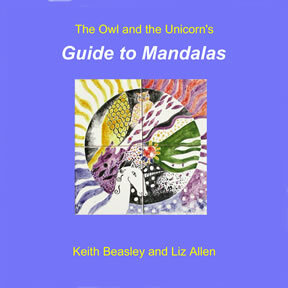 Based on Keith's mandala presentation (available for gatherings - see our Mandala FAQ for more info) and using mandala paintings by Liz Allen, this book encourages and enables you to draw, paint or otherwise create mandalas that are truly yours . . . sometimes they'll be works of art, sometimes healing scribbles, but they'll always be something special to do.